THE Round Six Men’s SBL Player of the Week has been awarded to Shawn Redha ge of the Textile WA Perth Redbacks. Perth Redbacks and ex-Wildcats star Shawn Redhage has put in two strong performances for his squad, helping them to third overall on the Men’s SBL ladder. On Saturday, the Redbacks played host to the Goldfields Giants, where Redhage led all scorers with 29 points which included going 13/16 from the free-throw line. He also added 8 rebounds, an assist, a steal and a block, in an 83-69 win for the newly branded Perth Redbacks. 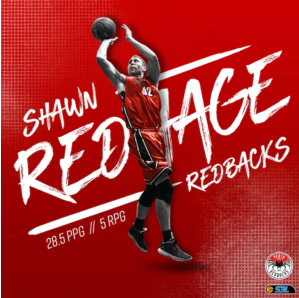 Redhage was able to provide another strong showing on ANZAC Wednesday, as the Redbacks defeated the Mandurah Magic 113-82. The Magic had no answer for Redhage, who put in 28 points, 6 assists, 2 rebounds and 2 steals in just 28 minutes. Impressively, Redhage shot 76%FG, 50%3PT and 100%FT – ending the weekend 20/23 from the line. 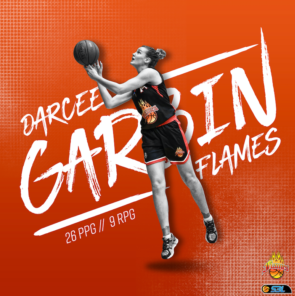 THE Round Six Women’s SBL Player of the Week has been awarded to Darcee Garbin of the Latitude 32 Rockingham Flames. The Rockingham Flames have sent a clear message to the rest of the league in both Men’s and Women’s leagues, and the WSBL squad have rallied behind Garbin’s dominant display. In just 24 minutes, Garbin managed 21 points, 4 rebounds, an assist and a steal against the Eagles Friday night. That included going 60% from the field and 42% from beyond the arc. The Flames won that contest 92-60, but Garbin’s best was still to come. The following night with the Flames away at South West, Garbin poured in 31 points, 14 rebounds, 2 assists and a block. Furthermore, Garbin went 73% from the field and 100% from the three-point line – a perfect 4 of 4. The Flames emerged victors 78-51. Graphic by Sports Imagery Australia. News originally from SBL News room.